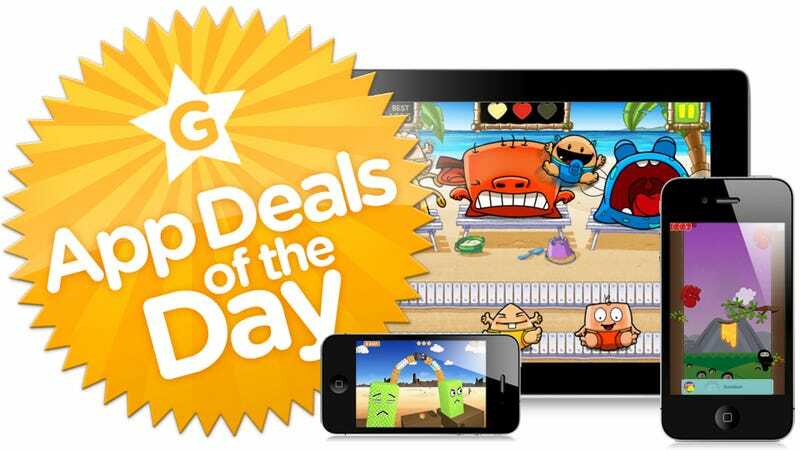 For today's app deals, we find out that monsters will eat pretty much anything. No really, they are totally craving plump little babies and for some reason, your homework. Ninjas love climbing trees to defeat evil. And for our Android-loving penny pinchers out there, we remind you that samurais are all about vengeance. Deliciously cheap, sword swinging vengeance. Monsters have stolen your homework and for some reason, you want it back. This 3D physics puzzle shooter tasks you with shooting monsters off of a box where they are holding your homework hostage. Spin the box for an optimal target and fire away. Dropped from $2 to $1. Let's keep the monster theme going, but this time we're trying to appease a monster's appetite. I think we all know that monsters love babies. They find them delicious. Why do you think they're hiding under your bed and in your closet when you're young? this app wants you to throw babies into the mouths of monsters for points. Hey, a monsta's gotta eat. Dropped from $2 to Free. Won't you take me to, Ninjatown! If there's anything Ninja's love more than assassinating people, it's climbing trees. In this Doodle Jump clone, you'll be battling your way up the tree line to defeat the evil Mr. Demon. Hey look at that, another monster reference. Dropped from $2 to Free. There's nothing Samarai's love more than revenge. It's part of their DNA. So it makes perfect sense that Samurai II: Vengeance is about revenge. Actually, it's right there in the name. With a virtual joystick and sword slicing action why not throw this on your Android and pretend you live in feudal Japan. Dropped from $3 to Free.